Your wheel bearings may be something to which you've never given a thought while driving around Alpharetta GA. Wheel bearings are what enable your wheels to spin freely. Since they bear the entire weight of the vehicle, they have to be tough. Wheel bearings can last well over 100,000 miles. They do wear out though and must eventually be replaced. You might hear a groaning sound from your wheels. The sound might disappear at some speeds and reappear at others. Your Alpharetta GA service technician at Alpharetta Service Center can quickly tell if your bearings are bad by raising the vehicle and wiggling the wheel. When you grasp the top and bottom of the tire, it shouldn't move along the vertical axis. Many vehicles these days have wheel bearing assemblies that cannot be serviced at Alpharetta Service Center. When the bearings go bad, we simply replace the entire wheel bearing assembly. For those vehicles with wheel bearings that can be accessed, we can do some preventive maintenance. You may have heard the phrase 'pack the bearings'. With this procedure we remove the bearings, carefully clean them and inspect for any imperfection or wear. If the bearings can be reused, we reinstall them and pack them with grease. If not, we put in new bearings. Check your owner's manual or ask your Alpharetta GA service advisor at Alpharetta Service Center if your bearings can be serviced, and if so, when should it be done. Now, taking care of bad bearings is extremely important. 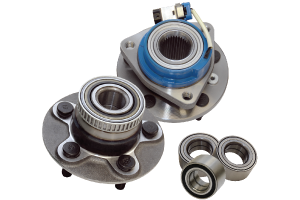 When bearings go bad, they generate tremendous amounts of heat – enough to lock up the wheel. That's not a good thing at any speed. In some cases the wheel can even fall off. Either of these could cause a serious accident. So have your wheel bearings inspected if you suspect a problem and replace them right away if there is one. If you drive in axle-deep water, like crossing streams, launching a boat or fording deep rain puddles, your wheel bearings are at risk for water contamination. You may need to inspect your wheel bearings more frequently. And don't forget your trailers; especially boat trailers. It's a good idea to get them serviced at the end of the season so bearings don't rust over the winter. At Alpharetta Service Center in Alpharetta we install quality NAPA replacement parts. Give us a call at 770.751.7074 and let us help keep you safely and economically on the road.